Nothing too exciting but I had a corn on the cob that needed using. I knew I had a recipe but couldn’t think where I’d seen it (remembered since that it’s in Joni’s Zine, must try it soon!). All I did was whisk some chickpea flour with water until I had a stiffish mixture. 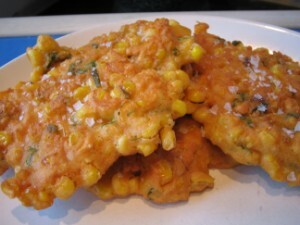 Added the sweetcorn, some smoked paprika and a chopped chilli, mixed together and fried. Simple and tasty.